Introduction: The Okinawa Karate News has been published in Okinawa since July 2005. It has made itself a name as it is available at the Shureido Shop in Naha City since its beginning. Okinawa Karate News offers the current news about traditional Okinawan karate and kobudo as well as what's happening in Okinawa regarding karate and martial arts, regardless of styles and politics. 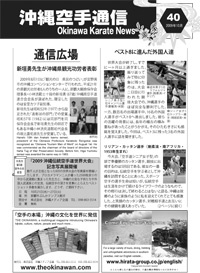 Foreign organizations affiliated to Okinawa schools also get their news published.